Shrouded in a miasma of Terr'r music, demon worship and drugs, the self-styled cultists of ReignofEvil.com proclaim their deviant beliefs to the world and reap a crop of naive young nova-worshipers. Sweet innocence is always ripe for the reaping. Clothed in make-up, mysticism and black leather, the rebels at ReignofEvil.com are part counter culture, part cult and part unfolding melodrama. 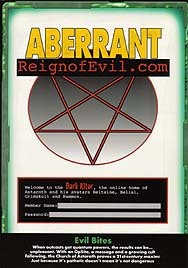 Aligned with neither Project Utopia nor the Teragen, the unholy followers of ReginofEvil.com are an extremist faction all their own. They're playing the Devil's tune. Care to dance?